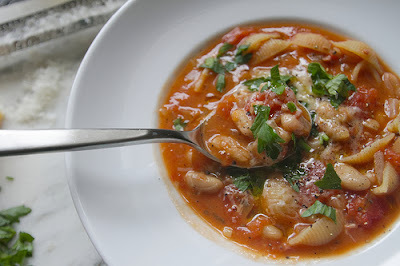 First, I made this pasta fagioli soup last night and absolutely loved it. It looks simple but what makes it fantastic is you start it with pancetta (or bacon. Maybe try turkey bacon if you don't eat pork), which gives it a rich flavor. Simmered with a pinch of red pepper flakes, it comes out just slightly spicy and pretty awesome on a cool fall evening. I used maybe a whole teaspoon of red pepper flakes because I like my soup with a little extra kick. I served it with a side of garlic bread and was in hog heaven. 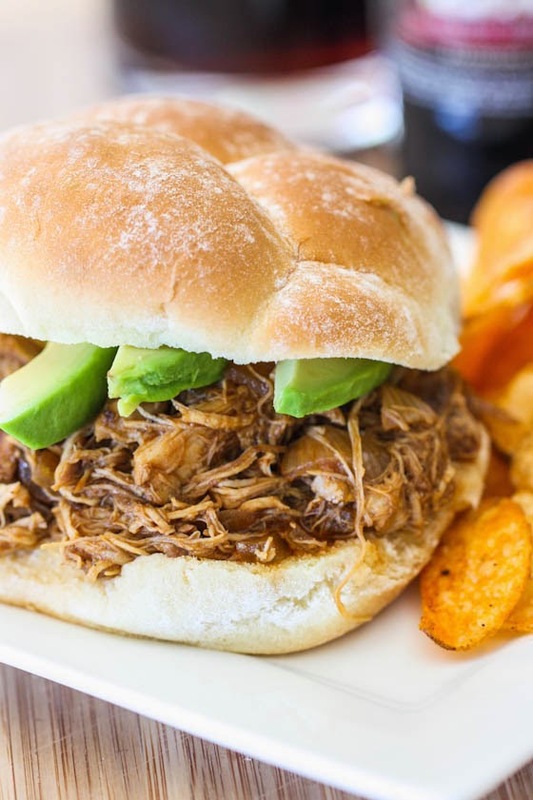 Shutterbean has lots of great recipes if you'd like to follow her. 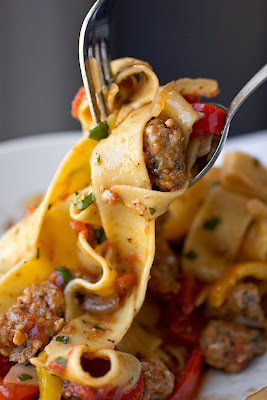 I've made these Italian Drunken Noodles a couple times and I really like them, even though the peppers give me a little heartburn (pregnant people problems). My suggestion is to use spicy sausage (if you like your food spicy), and to get sausage that's already out of the casings if you can. My local Whole Foods sells italian sausage this way, thankfully. Don't forget to salt the recipe at some point, and if you can't find papardelle, egg noodles work really well. Muy delicioso. And now, baked ziti. My husband LOVES this one. I've made it a couple times. Anyway, the first time I made this was for Christina, who doesn't eat red meat, so I just used ground turkey. Still really fabulous. I used beef the second time around -- still fabulous. 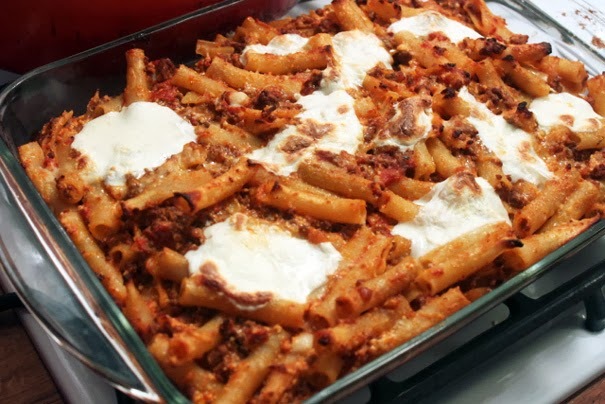 It's cheesy and gooey but then also has these crispy edge parts that don't sound delicious but really are. I really like Amateur Gourmet -- he's the one who clued me in to the breakfast potatoes recipe I love so much, too. Another big winner with the husband -- Crockpot Rootbeer Pulled Chicken. So simple, and so delicious. Chicken thighs, onion, barbecue sauce, rootbeer, a few splashes of Tobasco. I made sandwiches with them, and let me tell you my secret to really killer sandwiches. You take your buns, butter them generously on the inside, then toast under the broiler. Then I added mayo and a little red onion. Sounds so simple but it's pretty killer. I've tried a couple other recipes that were flops so I won't bother sharing those. These ones are the real winners. What have you been eating lately? Got any recipes to share?